How is his offsprings? Any photo of his offsprings? What about with his bitework? Anybody seen his Körung? i ageree whit Double B. this dog is very god when he is not in movement but in movements in Karlsruhe he was all time in "pass-gang" and his ears were not strong enought for his age. i made some records of pedro in Karlsruhe and on this records i can see now that Doublr B. has apsoloute rights. I have to agree with Jens, these two young dogs are in a very good position to excell in the next few years. 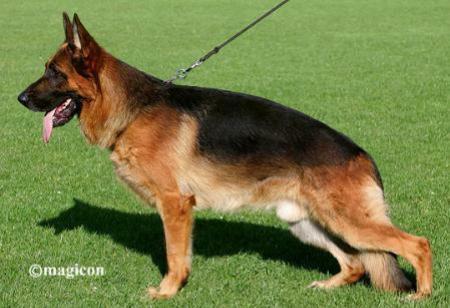 I saw them at the Sieger Show and two days later at Leonard Schweikert's schutzhund club and neither dog showed any softness at all in the ears when I saw them gaiting in the ring in training that night or at the sieger show. Absolute gorgeous looking male. I have seen him in Karlsruhe and he impressed me very much. And I can¿t agree with Double B.Pedro is just a wonderful male with a very nice sister and a very good family background.This dog will do his way! Â good structered dog. But very soft ears. Just like his sister, she 2 weeks before the siegershow build ups in her ears.